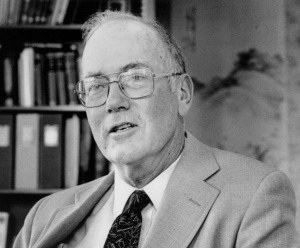 Charles H. Townes was born in Greenville, South Carolina, on July 28, 1915. He attended the Greenville public schools, Furman University (where he received a double degree in Physics and Modern Languages), Duke University and Cal Tech, where he received his Ph.D. in 1939. He worked at Bell Labs during World War II designing radar bombing systems. As a faculty member of Columbia University, he developed the maser in 1954; in 1958, he invented the laser with his brother-in-law, A.L. Schawlow. He was a Guggenheim Fellow and a Fulbright Lecturer during 1955 and 1956, first at the University of Paris and then at the University of Tokyo. He also taught during summer sessions at the University of Michigan and at the Enrico Fermi International School of Physics in Italy, and in 1963 was the Scott Lecturer at the University of Cambridge in England. In 1961, Townes was appointed Provost and Professor of Physics at M.I.T. In 1966, he became Institute Professor at M.I.T., and later in the same year resigned from the position of Provost in order to return to more intensive research. In 1964, Townes was awarded the Nobel Prize for Physics, shared with a Russian team that also developed early masers. In 1967, Townes received the IEEE Medal of Honor "for his significant contributions in the field of quantum electronics which have led to the maser and the laser." He has received numerous additional honors. The interview begins with Townes' childhood, including an early entry into college at age 16, which he was not led to think of as precocious at the time. He describes his wide scientific interests and reasons for focusing on physics. He outlines his work at Bell Labs, in both physics and engineering, and his reasons for leaving. He recounts his inspiration for the maser and the skepticism that the idea faced. Once it was successful, he gravitated to radio astronomy, one reason for developing the laser. He ends by discussing his approach to problems and by assessing his accomplishments, which include the discovery of complex molecules in outer space. Interview #124 for the The IEEE History Center, The Institute of Electrical and Electronics Engineers, Inc.
Charles H. Townes, an oral history conducted in 1991 by the IEEE History Center, Hoboken, NJ, USA. You were born July 28th, 1915 in Greenville, South Carolina. My father was a lawyer but he also had some farms and was interested in the outdoors. My mother was thinking of going into medicine when she went through college, but that wasn’t the thing for young women to do at that time. After working in her father’s office for a while she got married. She was the mother of six children and was pretty busy with that. What was your birth order? I’m number four. I know the first and the last children are supposed to be specially favored. I was the youngest of four for eight years before the last two came along, so as I grew up I got picked on as the youngest and treated favorably. What careers did your brothers and sisters choose? My older sister studied library science and became a librarian. My next sister taught Latin. They each have a master’s degree. My older brother was a very well known entomologist. He was at the university and did independent research for quite a while. My younger sister was a musician. She married Arthur Schawlow, who was down at Stanford and worked jointly with me on the laser. He also has a Nobel Prize. My youngest brother followed the family tradition and became a lawyer. My grandfather was a lawyer too. You went to Furman University and graduated in 1935. Did you graduate from Duke in 1937 and Cal Tech in 1939? Yes. Actually I left Duke in ’36. I was there only one year to get my master’s degree. I finished my thesis maybe two days later than required so that the degree was given the next year. I was there one year and then was at Cal Tech three years. How did you come to take both modern languages and physics? I was rather young in getting to school. Unlike most states, South Carolina had only eleven grades before going to college instead of the twelve. I got kind of bored with school and talked to my parents about it. They said, “Why don’t you skip a grade?” and so I skipped a grade. Therefore I was pretty young when I entered college. I had just turned sixteen, but I also took some college courses during the summer of my fifteenth year. My parents thought I was a little too young to leave home. I would have finished my degree in three years at Furman University instead of four and so I would have been still younger. They thought, “Well, go to stay another year.” To stay another year I just took two degrees to have something to do. I never expected to really be a linguist by profession, but I like modern languages and I took some Latin and Greek too. It was a useful hobby, but I really planned to go into science all along. Were you a good student as a child and then in college work? Generally I was an interested student. I was a good student, but I didn’t specialize on grades and had a lot of science hobbies outside of school. I never took any science in high school, for example, because the high schools were not all that good in science. Math was taught well, however, and I took math. I was not Valedictorian of the high school. All three of my sisters were way up there in grades. I had good grades, but not the very top. I felt that school was good, but not all that challenging. Did your parents or others consider you to be precocious for your age? I never got that feeling particularly. Physically I was a healthy, good average child. My parents and brothers and sisters were all intellectually oriented and I never felt there was anything special about me intellectually. Was skipping a grade a big deal at that time? It was not very common, but it was occasionally done. A few others did that, but not a large number. I knew I was a good student but would not have considered myself precocious. Did you do innovative projects as a child? Yes, I had a lot of projects. My father liked managing farms and I was brought up on a small farm. We had farms that he had tenants were operating, but I picked cotton myself some and there were a lot of projects. I built buildings and we had lots of different kinds of pets, and I collected a lot of things. I had collections of stamps, coins, leaves and rocks. We would catch things and keep them for a while as pets, such as snakes, rodents and fish. I did a lot of things with my older brother from whom I learned a great deal. He was very active and interested in natural history. I had a cousin who was in the electrical engineering department at Thompson College. He gave us one of his cast-off early radios, so my brother and I played with the radio fairly early and we were always building things and trying to figure out things. Do you remember your first inventions at that age? I used to design things and make sort of special boxes for collections and I would build things. I wouldn’t say there was anything that was a real invention, but I was innovative in the sense that I was doing things that were different from what other people were doing. As a boy I remember building special boxes out of thin wood for various kinds of housing with special windows and devices for keeping insects and so on. And I made a tent out of an old piece of canvas. I might make one other comment about my early upbringing. My family was quite religious. My parents were quite ready to take positions that were in disagreement with the rest of the society around them, though they did not make a great point about it. They felt that some things were not right. Therefore I was quite accepting of the idea that one doesn’t agree with everyone. If you’re different and have your own ideas, then you do things your own way. My parent did not stick out as being people who were different necessarily, but they were quite ready to be different when necessary and expected us to be different when necessary. I think that played an important role in my life. I don’t mind people telling me that I’m wrong. I have to think for myself what is right or wrong. Yes, we have four children. My oldest daughter is a psychologist, my second daughter is a biologist and new anatomist, my third daughter is a musician and my fourth daughter is interested in environmental problems and is just now getting an engineering degree. They are all pretty and they are all married. What were your earliest fields of technical interest? My earliest field of technical interest was natural history, biology in particular. I had a big butterfly collection. My brother collected them also and we competed with each other. I also collected certain other kinds of insects and shells. I was really interested in classification and learning about the nature around me. I thought I might go into biology and I took a good deal of biology in college. And I liked mathematics quite well too. My older brother was a biologist. I’ve often said he was so good at it that I decided I couldn’t compete and better do something else. There’s more to it than that, of course. I didn’t take any physics until my sophomore year at college. After I had taken my first course in physics I decided that was really the science I wanted to do. I knew I was going to do some kind of science. It was just a question of which one. What was it about physics that attracted you? It was the clarity of thinking and the logic that I liked particularly. I debated between mathematics and physics but felt that physics had more to do with the real world. I liked that. I was very familiar with the real world, having built a lot of things and collected animals and so on. It was quite clear to me that physics was really what I wanted to do, so from then on I took all the physics courses they had at the college. Then I took a master’s degree at Duke University. Did you start specializing in research at that point or not until the Ph.D.? I didn’t specialize in college. Actually there was not enough physics there to do any specialization. In order to major in physics my last year I just studied the book and worked the problems because there was no other person taking four years of physics. The professors were very intelligent but they did not do research, so there was not a great deal of physics at Furman University. When I went to Duke, I specialized in the sense that I did a master’s thesis on the Van de Graaff generator. That’s a high-energy machine. Nuclear physics was in great vogue at that time. I did a master’s thesis on that but was not overly taken with that field partly because it was so popular. I tend not want to do the things that everybody else is doing. I generally feel that if a field is very popular and everybody thinks it’s the thing to do, then there are enough people doing it. It is more interesting to try to find things other people have not yet seen. That was one reason for my not going into nuclear physics when I went to Cal Tech. I did something related to nuclear physics that I felt was different. That was the measurement of the spins of nuclei, the angled [correct word?] momentum of nuclei and ball spectroscopy and isotope separation and quite a number of different techniques. There was still more specialization there, however, that obviously was not related to things I did later, although I learned a lot from it. I continue to do the spectroscopy I used then, in a sense. Did you discover anything new at that point? Yes. I determined the spins of certain nuclei that had not been known before. I worked on the spin of carbon 13, nitrogen 15, oxygen 18. Those are isotopes of common elements and their spins were not yet established. I wouldn’t say it was world-shaking. Then Bell Labs hired you. Yes. I really wanted to go to a university. I have frequently said that many of my successes really come from my failures. When I was at Duke I tried for the only fellowship they had. Fellowships were scarce. Even getting into Duke was not all that easy. I applied to the big schools for some kind of financial help. I was looking for a teaching assistantship or something of that sort. None of the big schools offered me anything. I applied to Cornell, Chicago, Princeton and so on. Duke University was closer by, and presumably they had heard of Furman. I got a teaching assistantship there. I applied for the fellowship at Duke and didn’t get it. I decided I had better just go to the best place there was at that point. I took a bus across the country and started at Cal Tech. Cal Tech would accept students then but didn’t have money to help them. It was easy to get into the school. I went out there with the five hundred dollars I had saved, and it lasted long enough. In the middle of the year Cal Tech gave me a teaching assistantship. I had to work very hard at Cal Tech because I had not had many of the courses that the Cal Tech undergraduates had already had. I wanted to stay in the university and had applied for a National Research Council Fellowship, which was the big postdoctoral fellowship at that time. Everybody told me I would probably get it. However, Bell Labs came along and offered me a job. I thought I would not take it, but my professors all said, “Look, there are not many jobs around.” This was 1939 and it was still considered the Depression. There weren’t many jobs. They advised me to take it and pushed on me. I knew Bell Labs was a very good place even though it was not a university and there was good work being done there. I went to Bell Labs wanting to do basic physics, and they let me do that for awhile. They were very generous. Then the war came along and I was assigned the job of developing military equipment – particularly radar navigation and bombing systems that would be able to fly through clouds and let our pilots maneuver while they were bombing instead of just going over and dropping bombs all over cities in the hope of getting more accuracy. Did you make any breakthroughs when you were doing the basic physics there? I did a few things. That lasted only about a year before I was reassigned. They were again very generous and thoughtful. They put me three months each in several different fields. One cannot accomplish much in three months, but I did publish some papers. I worked on the theory of sputtering and I wrote a basic paper in the field. I had some inventions in generation of microwaves. I worked on magnetism a little but didn’t publish anything on that. I was told on Friday that next Monday I was to start doing engineering system design on these military things. I didn’t like that at all. It was a failure, but I learned a great deal from it, and what I learned there has been a very important part of my subsequent thinking about microwaves and electronics and so on. I was mainly designing a system in which I had a number of inventions and new ways of looking at systems. I designed some new kinds of system analysis. Towards the end of the war I was working nights and Saturdays on another problem that attracted me, when it was not essential to work on our military systems. That was the generation of radio waves in interstellar space. That had not been explained at that time and nobody understood what caused it, so I worked on trying to think that through. I think I developed the first reasonably sophisticated theory of what was producing those microwaves. I published that at the end of the war. That would have been 1945, because it was the end of the war. During the war I also recognized that microwaves might be used for very high-resolution spectroscopy, an excellent type of spectroscopy. That had not been done and it gave a spectral resolution that would be fantastically good. It relied on a phenomenon that hadn’t really been thought through, that lines get sharper and sharper if they are not saturated. At lower and lower pressures of gas the lines can get almost indefinitely sharp. There was some scientific argument about that at Bell Labs. Some people didn’t believe it. I was eventually able to persuade Bell Labs to let me do that. They were eager for me to continue in engineering, but I really wanted to get back to physics. Happily, after the war they allowed me to get back to physics. I started working in that field and that field opened up and became a very important field. Did you work on the physics of some of the things that you had been working on in the engineering? I used much of my engineering background, and that had to do with microwaves and their control and use and so on. It was in that process I realized that microwaves are of a particular frequency and get absorbed in water vapor in the atmosphere. We were assigned the job of developing a radar system at that frequency. I knew it was likely to give us trouble and that the radar would not work very well. I took that up the line to various people and argued with them, but was eventually told by my superiors that the decision had been made to go ahead and work on that frequency. We worked on that frequency and when the radar was tested it did not work. The whole thing was a failure. That failure was very important to further developments because it made a lot of equipment at that wavelength available. That was a wavelength of one and a quarter centimeters and it was that equipment which allowed me to get started on microwave spectroscopy and start doing physics after the war. It was on surplus, was very cheap and it could be gotten everywhere. Bell Labs had a lot of it that I could use. I used both the equipment and the ideas and problems that had turned up. I think that’s always the way. Future work comes out of past work and past knowledge. It may look very different, but in fact those are the ideas one has in the background. It was a brand new field. I would say there were three independent starters in that field. There was one in England, the group at Westinghouse, and then myself at Bell Labs. We were all fairly independent and initiated the field of microwave spectroscopy. I eventually wrote a book on microwave spectroscopy about 1955 when I felt the field had developed. We explored most of the physics. From then on it was going to be an important field to chemistry, but as a physicist it was time for me to move on to something else. You got out of microwave spectroscopy in 1955. When did you get into the field? 1945. I have changed fields quite a lot. I enjoy doing that, and once a field is well established and there are lots of people are in it, I don’t feel it is necessary for me to do it anymore. It is not as interesting, because everyone knows about it and they are working at it too. I feel it’s much more fun to open up a new field and look at something different. I took a sabbatical. The maser was invented towards the end of that period. That grew out of microwave spectroscopy and my desire in particular to get down to still shorter wavelengths. I wanted to get down to shorter wavelengths to do more spectroscopy, and the lines became more intense with shorter wavelengths. Therefore I looked very hard at ways of getting down to millimeters and sub-millimeters or below millimeters and into the fine grid and so on. I tried and tried and thought about a number of techniques. I tried some things that sort of worked but not too successfully and not a way that I felt could be extended. Finally I hit on the idea of the maser. That came about rather suddenly, but it was also probably five years of work of thinking about the problem in general while at the same time doing a lot of other things. It came to me suddenly and we built a maser. I always did things with graduate students and this was Jim Gordon’s thesis, and a postdoc worked with me. I was at Columbia University. I left Bell Laboratories to go to Columbia on January 1st, 1948. I still preferred to be in a university, so when I got a good opportunity I took it. I was basically doing university type research at Bell Laboratories and they supported me well, but they weren’t going to expand the field. They really didn’t want to go into that kind of thing heavily. Columbia University was an invigorating environment too. Bell Laboratories was a fine place and so was Columbia. You said the idea for the maser came to you rather suddenly. Yes. The Joint Services supported the laboratory at Columbia where we worked. I worked there with Professor Isidor Rabi, Professor Polykarp Kusch and Professor Willis E. Lamb. All of them have Nobel Prizes. Kusch and Lamb didn’t have them when I first went there but got them during that period. It was a very interesting and good group of people. I was doing something a little different from each one of them, but we interacted a fair amount nevertheless. The Armed Services supported the work in a general blanket grant. They knew I was interested in trying to produce short waves and the Navy was interested. The Navy asked me to chair a committee to examine the best ways to produce short waves so they could decide what types of research to support in the universities or elsewhere. I chaired that national committee of representative people. For example John Pierce was on that committee. He wrote an article about the general problem to try to create interest. I asked him to write it because he writes so well. A number of other people in a variety of fields that might bear on this problem were also on the committee. We listened to a lot of different proposals and talked with a lot of people for about a year and a half. Then we had a meeting in Washington. I felt we had done a careful job, but we didn’t see a good way to do it. I had already argued with myself about this and had in fact written a memorandum at Bell Labs about the possible uses of molecules in electrical engineering and to handle waves and react with them. I pointed out that it was not very difficult to get very much energy from them because of the second law of thermodynamics. In a way, I had already been through that. However, suddenly I realized the second law of thermodynamics didn’t necessarily have to apply. This is because one can go into a non-equilibrium state not characterized by a single temperature but rather by what is called negative temperatures where high-energy states are more populated than low-energy states. Then that limitation disappears and something can be done. Then it pretty immediately occurred to me the best way to select out states. We generally have a high population of single states and excited states with a molecular beam selection. Some of these other people worked with molecular beams at Columbia and I was familiar with them. I quickly pulled out a piece of paper and figured out what was needed and whether or not given enough molecules it would work. I decided it probably would work with a cavity and a molecular beam system and so on. That was the origin of the maser. It all occurred, I would say, in about 15 minutes. It was one of those storybook cases. I felt it would work but it would be difficult, and I was hesitant about putting a student on it. I waited until the fall and then the spring. I had a few students coming to me about every couple of months or so. Jim Gordon came, and he had worked on molecular beams already at MIT as an undergraduate. He was a good student. I explained to him the problems and that it was going to be hard, but told him, “Even if you don’t make it work during your thesis work there are some interesting things to do with it. There is some interesting spectroscopy and you will get a good thesis in any case. Whether or not you can make it work in that kind of timeframe, I don’t know. But I think there is a good chance.” He was willing to take that chance. And then Herb Zeiger, a postdoc who had worked with Rabi – maybe it was Kusch, but I think it was Rabi – was also familiar with molecular beams. He came and worked with me for the first year of that project. It took about three years to get it going. That’s a fairly normal time for a student thesis. There were some debates about it. What is your typical reaction to this kind of disagreement? It does not bother me at all in the sense that I am not emotional about it. If someone disagrees with me I think about their arguments and ask myself if they are really right. It calls for self-examination, but it is never disturbing to me. If I’m wrong, I’m wrong. Every scientist has to be wrong every once in a while. And we have to examine our own ideas. In a few cases it was a bit of a nuisance when people bothered me too much about it when I was sure they weren’t right and they were sure they were right. After I had worked on this thing for two and half years Professor Rabi and Professor Kusch came into my office one day. They beat on the table and said, “Look. This is not going to work. You know it is not going to work, and we know it is not going to work. You are wasting money. You should stop.” Fortunately I had tenure. They were the past and present chairmen of the department. However, again I told them, “Well, no. I think there is a reasonable chance it will work.” And we had it working about three months later. Was this funded by the university? It was funded by the Armed Services, but it was a joint laboratory run by a group of professors. Therefore they had some but not complete authority to take the money away from me. I could have argued with them because on a more or less equal basis even though I was more junior. I simply told them, “No, I think it has a good chance of working and I want to continue to work on it,” and they left. They didn’t bother me further. However, they were initially pretty insistent. One has to recognize that new ideas are not going to be agreeable to everyone. I didn’t find that upsetting. I just thought, “Well, that’s what they think. I don’t think they are necessarily right. This is what I think I ought to do.” After we got it working Professor Kusch came back and said, “Well, I guess you know more about what you are doing than we do.” He was very gracious about it. Did you take a sabbatical after this period? I took sabbatical at that point. The maser was a great success in a sense. It had some remarkable properties. I had planned for a long time to take sabbatical. I had just finished a book on microwave spectroscopy which I felt sort of ended an era in that field. I wrote that with Arthur Schawlow, with whom I have collaborated a good deal. I felt this was the time when I should think over what I wanted to do. I spent fifteen months abroad in Europe and Japan working out things and thinking about things. I looked at radio astronomy at considerable length. Did your family go with you? Yes. All our four children traveled with us. We had a very nice and very pleasant sabbatical. I worked in a laboratory in Paris, and one of my former students happened to be there. He was working on a solid-state material in which he had found a very long relaxation time – electrons that stay in the excited state for a very long time in this material. I realized that could make a good solid-state maser amplifier. That was the first serious maser solid-state amplifier. I worked on it there for a few months with him and a French physicist and we published something on it. We did not get it operating, but we made enough tests on it to make it look very promising. Then I went to Japan, and again I was thinking about a variety of things while looking at what they were doing. I was at the University of Tokyo and visited a friend of mine, Shimoto, who had worked with me at Columbia. I was still thinking about the maser and trying to figure out just how good an amplifier it would be. Then I ran into a biologist friend of mine who had worked on bacterial populations. The theory he had used was just the thing that got me started in understanding the noise of masers, and so I worked on that with some Japanese colleagues. By the time I came back I had a number of interesting things I wanted to work on, but I felt working on the maser was probably the right thing to do at that point. Therefore I started developing a solid-state maser to do radio astronomy. From then until the present time what were the other technical areas in which you made innovations? I was then going into radio astronomy but using maser amplifiers as a tool because they gave better sensitivity than anybody had ever had. We did some interesting work. Was the radio astronomy just out of an application for masers or did you have a particular interest in that field? I was very interested in radio astronomy. I had debated going into radio astronomy at the end of the war, as a matter of fact. It is interesting again to see how people’s advice is not necessarily right. I visited a well-known professor of mine who was then head of Palomar and Mount Wilson Observatories. I felt he had been very kind to me when I was at Cal Tech and I thought very highly of him. I told him that I was thinking of going into radio astronomy and I felt that would be an appropriate thing to do at Bell Labs. I asked him if he had any suggestion as to what would be the most important things to do in radio astronomy. He said, “I’m sorry to disappoint you, but I don’t think radio work is ever going to contribute anything to astronomy. I just don’t think it’s going to be of any use.” I was sure he was not right, but on the other hand it did not give me good cues as to what to follow. I debated between radio astronomy and microwave spectroscopy and decided to go into microwave spectroscopy. It was a combination of two fields in which I was interested – the maser and the possibility of doing better radio astronomy. When was this second wave? I sat down and thought about it and worked out some equations and so on. I was aiming for the far infrared wavelengths about a tenth of a millimeter. That had been my original idea with the maser. The question was how to do it well. However I realized from the equations that it would be just as easy and maybe easier to go right down to the visible region, because all the available techniques were better worked out. Arthur Schawlow was my brother-in-law by then. I told him what I had been thinking about this. It wouldn’t be so easy to get a single pure frequency, but at least we would get a lot of power. And I felt I saw some ways of getting reasonably pure frequency by opening up holes in the resonator and so on. And he said, “What about just using fabric row?” Well, that was the real idea for the resonator alright. We immediately started talking about it and working out what it would do in a fabric row. It turned out it could select a single frequency. From then on we worked on this together. Then we wrote a paper, which was the first laser paper. Roughly when did the laser work wrap up? I haven’t really left the laser business completely. I use lasers all the time in my present work, but I stopped active work non-linear optics and laser research probably around the early seventies. Was this again because the field was getting popular? Yes. It became a very hot field. I had gone to MIT after the period in Washington. I left just after we wrote that paper on the laser and started working on it in the laboratory. I was very eager to get one going. Then I was asked to go down to Washington, and my conscience would not allow me to turn it down. I felt Washington needed scientists during that period. I went down to Washington in the fall of 1959 and was there for two years. That was a substantial interruption in my scientific work. I went MIT where I was doing administrative work, but I insisted on doing some scientific work there and had a couple students doing laser work and so on. When I came out here [Berkeley] in 1967 I continued to do laser work, but I came out here primarily because I wanted to do astronomy. I continued to do work on lasers for a few years, but started immediately on astronomy. What was it about astronomy that appealed to you for so long? That’s the great world. To figure out what it is like and what is going on and how the universe came about and how everything is made and so on is very challenging. That’s my interest in natural history, you might say – or my interest in trying to understand the world in general. Astronomy is a challenging area, but so are many other things. I am still very interested in biology. However, I felt that the astronomers were missing a lot of bets, particularly using new technology working in the infrared and in the microwave regions. Back in 1955 I had given a talk and written a paper about the possibility of finding molecules in space. One of my students after graduating had gone on and found the first molecule with radio waves named the OH. Then it stopped. The astronomers were not doing anything in that area. I felt that no one was willing to try. I would give them a talk and try to boost them up about doing it and showed that it seemed possible, and they didn’t believe it. I felt they were missing bets in the infrared also, and again using quantum technology. Lasers were really hot by then. Everyone was going into laser work and making lots of money. Industry was doing very well with lasers. In fact all of the first actual lasers were built in industry. They were built by people from universities, many of them from my lab and from Bloombergen’s lab, people who had been working in this field and gone into industry. Theodore Maiman had worked with Professor Lamb, who was personally funded. He made the first major operating laser. The universities were also busy, and non-linear optics was a hot field and so on. There was lots of work. Have you been involved in astronomy ever since? Yes, but varying types astronomy. I decided to try to look for molecules. We found the first complex molecule. We found water and ammonia and that really opened up the field and it became a big field. I guess we found that in 1968. I worked in that field for six or eight years. That had become a big field by then and it’s a very substantial field of astronomy at this time. Therefore I have generally moved out of it. I was doing infrared in parallel and I was working some in infrared, but I generally moved out of standard infrared. I am doing interferometry now, which is a tough thing to do. I think it is quite important and it needs a very real effort, but in the long run it will come through and open up still a different field. Some of these areas seem like pretty big jumps. Did you ever have difficulty getting up to speed or did that sort of come naturally? Yes, I had some difficulty. Before leaving Cambridge, Massachusetts at MIT – I stepped down from being a Provost there – I spent a year halfway between MIT and Harvard and studied astronomy. I was particularly connected with the Harvard department of astronomy and listened to lectures and talked to people and so on. I had things to learn. On the other hand, I don’t think people outside of science realize how generally scientific principles apply. I could say that really I have just been doing spectroscopy all along. It is all electromagnetic waves and so on, you see. It is all closely related. The ideas are transferable. It’s true there are new ideas to learn, but many of the ideas are transferable and in transferring one gains insight that is different from that of people in the field. My engineering contacts really helped me enormously in conceiving the maser and getting that going. Physicists just didn’t think in those terms at that time. The same thing is true about the laser. All the optical physicists and optical spectroscopists had been working for years. It was an old field, and they just were not thinking in those terms, you see, whereas an outsider coming in with a little different viewpoint has a better chance for seeing new things. It’s clear that the technical community sees the maser and laser as your beats. Are those the discoveries that gave you the most satisfaction, or are there other things you have done that have been more satisfying? They have gotten the most publicity, of course, and affected the technical community and the common man much more than some of these other things. On the other hand I enjoyed the field of microwave spectroscopy. I think scientifically that contributed a great deal. I think discovering molecules in space was also quite important. In terms of my own direct contributions I think there are several other things that are comparable, but in terms of the technical importance and further elaboration the laser is clearly the thing. There is no doubt about that. What about in terms of your own personal satisfaction? In terms of my own personal satisfaction and what I consider real originality and discovery and so on, these other things are equally important. I do not think the difficulty of a discovery of an idea is necessarily very closely related to its own importance to society as a whole. In a sense the maser and laser ideas are very simple. They came out of things that have been known for a long, long time. I just put them together in a little different way.